Detained NDFP consultant Rafael Baylosis filed on Friday a petition for indirect contempt against the warden of the Metro Manila District Jail-4 for refusing to release him despite a court order. In his petition filed at the Regional Trial Court of Quezon City, Baylosis charged Jail Chief Inspector Jojie Jonathan T. Pangan’s refusal to release him as an act constituting improper conduct tending to impede, obstruct, or degrade the administration of justice, is disobedience to a lawful order, and tantamount to disrespect to the authority of the court. Baylosis was ordered for release on June 14, 2018 by the Regional Trial Court of Quezon City, Branch 100 upon posting of bail bond to allow him to participate in the GRP-NDFP peace negotiations. “The release order is still valid and existing. He has no warrant of arrest in any other case. So there’s no reason for the jail warden to disobey the release order. His continued, unreasonable refusal to implement it is a contemptuous act which not only violates Baylosis’ rights. It clearly shows disdain of the court which must be punished,” explained Atty. Rachel Pastores, managing counsel of the Public Interest Law Center, lawyer for Baylosis. Baylosis was to participate in the scheduled preliminary meetings and formal talks in The Netherlands and Norway. He is presently a member of the NDFP’s Ceasefire Committee. He has been part of the peace negotiations in various capacities since 1996. He is facing trumped up charges of illegal possession of firearm and explosive at RTC Quezon City, Branch 100. “The warden is not above the law. He is mandated to follow the rules and the law. It is in the public interest that warden’s willful defiance of a court order be sanctioned,” Atty. Pastores stressed. Marie Hilao-Enriquez, Chairperson of Karapatan and SELDA (an organization of former political detainees, mostly detained during the martial law era) today called on President-elect Rodrigo Duterte to “be more circumspect” on the issue of the burial of the former dictator Ferdinand Marcos, Sr.
“The Marcos family has not even apologized to the Filipino people for the plunder of the nation’s coffers during in the more than 20 years that they were in power. There is no remorse,” Hilao-Enriquez added. “Burying Marcos, Sr. at the Libingan ng mga Bayani is what the Marcos family wants the most for it will pave the way to clear Marcos’ name from the numerous human rights violations he committed during Martial Law,” she said. SELDA instead urged the President-elect to order the GPH Claims Board to hasten the process of recognition and indemnification of the martial law victims, which has taken a longer time than what is stated by law. SELDA members spearheaded the class suit filed against Ferdinand Sr. in Hawaii. The plaintiffs succeeded in the court case as the Hawaii Federal Court, and later the US Supreme Court found Marcos guilty of human rights violations. “We, families of victims refuse to bow down to one family’s desire to do what they like to do just because they belong to a powerful few. Let it be remembered that the Marcos family was kicked out by the Filipino people in 1986. That they were able to come back to the country is more than enough. It’s time to stop the haughtiness the Marcoses are displaying. They must return all the money they stole from the national coffers and render justice to the people they victimized.” Hilao-Enriquez concluded. Hilao-Enriquez is among the initiators of the Campaign Against the Return of the Marcoses to Malacañang, which campaigned against the vice-presidential bid of Bongbong Marcos. Political prisoner Rhea Pareja, 26 years old, is currently detained at the Female Dorm of Taguig City Jail. Ipinagkait na naman sa akin ang pagkakataon na makasama nang matagal ang anak ko sa huling sandali. Napaka iksi naman ng 3 oras. Di bale sana kung buhay sya, kahit kaunting oras lang kami magkita ngayon, dahil alam ko paglaya ko makikita ko sya, pero huling pagkakataon na ito na makakasama at makikita ko sya. Mga magulang din kayo, alam nyo ang pakiramdam ng isang magulang para sa anak, kapag magkakawalay kahit sandali. Lalo na kaya pag kagaya ko na wala na ang anak ko. Natakot ako noon na maging isang ina dahil alam kong mahirap. Pero nang malaman ko na buntis ako, napakasaya ko. Naging maingat ako, at gusto kong maging malusog sya. Pero nangyari nga na naaresto ako, at nahirapan sa pagkakapiit. Rights group SELDA (Samahan ng Ex-Detainees Laban sa Detensyon at Aresto) lambasted orders made by PNP Director General Alan Purisima to clear up detention cells at the PNP Custodial Center in Camp Crame, Quezon City to make way for so-called “VIP detainees” implicated in the P10-billion pork barrel scam. According to SELDA, Gen. Purisima’s order of providing decent jail for legislators accused of plunder reeks of double standard treatment for inmates in Philippine jails. “They have yet to charge and arrest these legislators implicated in the pork scam but they are already thinking of comfortable prison cells for these alleged plunderers. At any rate, there should be no special treatment, especially to those who are accused of plunder,” SELDA national coordinator Roneo Clamor said. The group, on the other hand, criticized the subhumane condition of prison facilities in the country, which is way below minimum international standards. “The PNP rushes to provide decent detention to VIP offenders because they know very well that prison facilities in the country are beyond habitable for human beings. Prisoners are in cramped and poorly-ventilated cells. They receive insufficient food rations, and they lack of medical services,” explained Clamor. Among those who suffer such conditions are political prisoners who languish in jails for crimes they do not commit, according to Clamor. “Political prisoners are consistenly maligned by the state. They are accused of trumped-up charges to justify their imprisonment. They are made to suffer under such conditions in a bid to silence their dissent,” Clamor said. 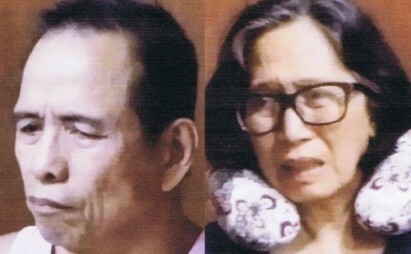 Also detained in the PNP Custodial Center are NDFP (National Democratic Front of the Philippines) peace consultants Benito Tiamzon, Wilma Austria-Tiamzon, Reynante Gamara, Eduardo Serrano, and other political prisoners Ramon Argente, Dionisio Almonte and wife Gloria Almonte. “Is Purisima’s folly idea to purge the current 70 inmates in Crame really designed to declog the custodial center of prisoners or a continuing scheme to silence political prisoners and hide the great divide in the treatment of inmates?” Clamor added. SELDA also assailed the deplorable condition of political prisoner Andrea Rosal, daughter of the late Gregorio “Ka Roger” Rosal, former spokesperson of the Communist Party of the Philippines, prior to the death of her child. The group joined other sectors in holding government state forces and agencies accountable on the death of baby Diona Andrea. Rosal was arrested on March 27 on trumped-up charges of murder, among others. At the time of her arrest, she was seven-months pregnant. 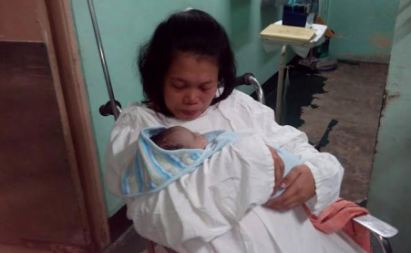 Rights groups reported that she was denied of proper medical attention while in detention at the Taguig City Jail Female Dormitory. According to Baldomero, the arrest of the Tiamzon and Austria showed the disinterest of the government in pursuing the peace talks. Ernan is the son of Fernando Baldomero, first of the 174 victims of extrajudicial killings under Pres. Aquino. “If the government is for the peace talks, why do they arrest and detain the other party to the negotiations? If they want to address the roots of the armed conflict, why do they kill, abduct, arrest and torture dissenters of the government’s anti-people policies?” said Baldomero. For the families of victims of human rights violations, justice is served when perpetrators of extrajudicial killings, enforced disappearances, illegal arrests and detention, and other human rights violations are arrested and punished. “It may be retired general Jovito Palparan or the elements of the police and the military who killed my father; or soldiers and paramilitary forces who terrorize communities in the countryside. They are the enemies of the people,” he said. In arresting Tiamzon and Austria, Baldomero said the Aquino government supposes it could get away from the human rights violations it has committed against the people. “The government wishes to be vindicated from its crimes against the people and the people will be cowed in their clamor for justice. The military calls the arrest a way to justice, peace and development. There can be no justice as the government continues to violate people’s rights,” he said. Rights groups scored the recent spate of killings, with an average of one victim killed a week. In the first 10 weeks of 2014, 11 activists, farmers and ordinary citizens were killed. 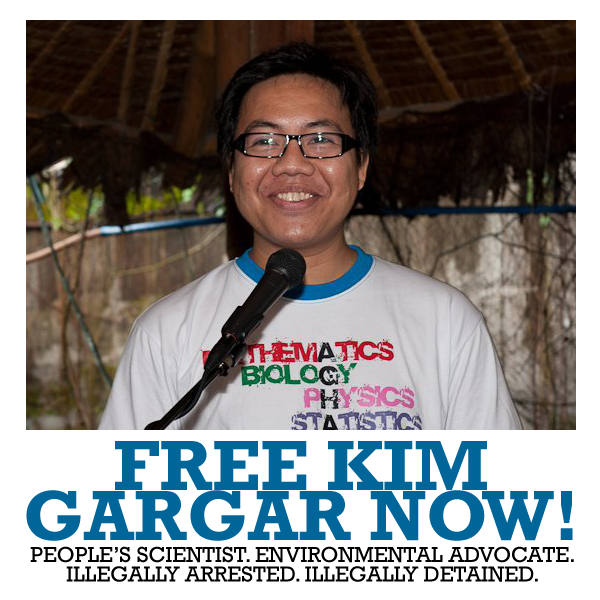 FREE TATAY NANTE GAMARA NOW!